Final media timeout. This would be a good time to warm up the Koenig Kounter. Who's with me? What's the Hail Mary equivalent in basketball, @AaronRodgers12 ? Rough night for Nigel Hayes (4-for-12, four turnovers) and Bronson Koenig (2-for-6). Purdue leads 65-40 with 2:15 left. Crowd is on their feet here in Mackey ???? Swanigan two turnovers away from a triple double. 18 turnovers for Purdue but Wisconsin has scored only 14 points off them. Final: Purdue 66, #Badgers 55. UW's nine-game winning streak is over. FINAL: No.20 Purdue 66, No.13 Wisconsin 55. Caleb Swanigan with 18 pts, 13 rebs. Isaac Haas w/ 13 pts. UW out rebounded 34-22. Let's bounce back at home. Don't understand that decision...at all. Giants needed momentum and you gave it to them. #Packers fail on 4th and inches. Heck of an answer from the Packers. Quick, timing routes right down the field to go back up by 8. #badgers finished at 14.3% shooting from 3 and 39% overall. Purdue D active and Swabian/Haas too much inside. That is a BIG answer by the #Packers offense. Potential game changing decision and failure is erased quickly!! The second 100-yard game for Randall Cobb this season, the other coming against the Giants as well. In addition to 17 pts, Happ has 6 steals, 5 rebounds, 4 assists and a block. 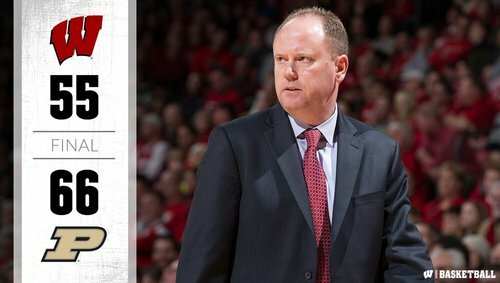 Gard said UW "could never get back up the hill" after the missed layup by Trice and the 14-0 run by Purdue. Called it a spark for Purdue. Not a great day for Beckham. He's gonna get killed in New York. #Packers RB Ty Montgomery walked off field very gingerly. Another bullet to Cobb and another touchdown to Cobb. #Packers lead it 31-13. 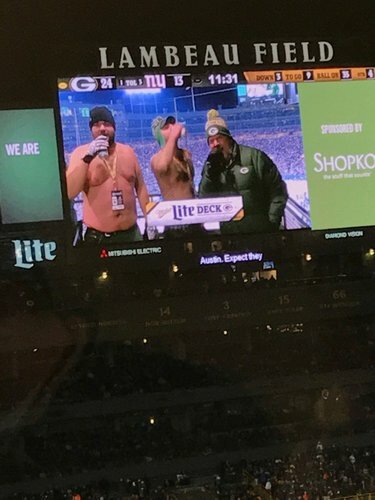 Chants of M-V-P ring out at Lambeau Field. Rodgers now with 19 touchdowns & 0 interceptions in this 7-game streak. THAT was such a P-R-E-T-T-Y throw by Rodgers to Cobb!!! Now... what will the status of Montgomery & Jordy be? Two guys thought that play was still alive. Matthews and Peppers. 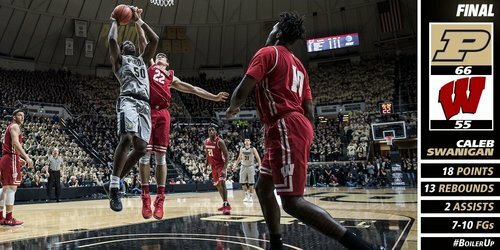 Quick thoughts: Purdue most complete B1G team I've seen. Should win the league this season. Bad matchup for #Badgers . In the 17+ minutes that follow, #Packers score 24 straight!! Early thoughts on #Packers at #Cowboys in the Divisional round next Sunday. Dallas MIGHT be vulnerable after bye week.